I first met Kinutani Kota in the early autumn of 2005. On the afternoon of that day, an editor who was a good friend invited me to visit a gallery with him and I willingly agreed. That was my introduction to Mr. Kinutani and his works. I liked both this young sculptor’s personality and his works. 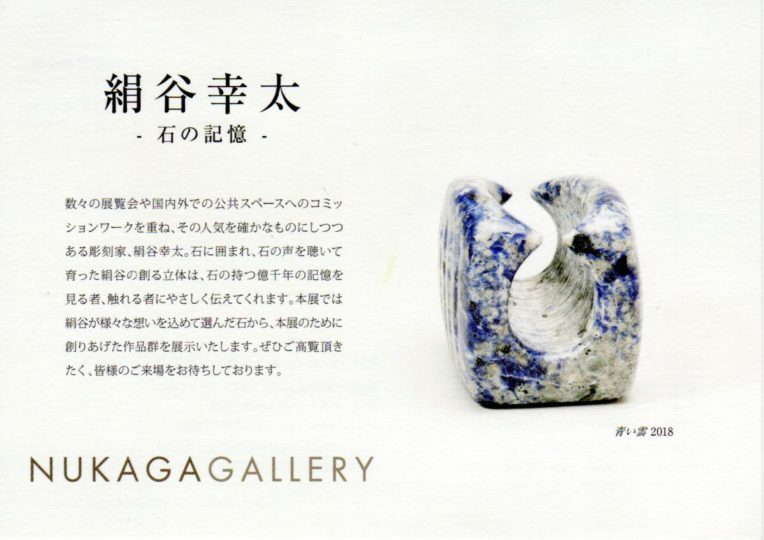 For Mr. Kinutani stone is Nature itself. He loves stone, and he seems to converse with it and to read deeply in its heart. This unique and rich sensibility took shape in his works and was there before my eyes. Stone may look cold from the outside but Mr. Kinutani’s works have an almost bodily warmth that is not found in Western sculpture. One might call it the pulse of life that each and every stone intrinsically possesses. I examined the works from various angles, sometimes even touching them or sitting on them. There is something poetic, even playful about them. The beauty and originality of Mr. Kinutani’s works possess great appeal for me. When I first met Kinutani Kota, I must admit I was taken aback. My preconceptions had led me to imagine a doggedly persistent, even aggressive sculptor grappling with massive hunks of inorganic matter, attacking them with a chisel and conquering them. That’s why I was surprised by his gentle visage, kind words, and instantly likable air of courtesy and nobility. At the same time I wondered: where was the harsh edge that seems innate to artists? Was he just very good at concealing it? This made me all the more eager to organize an exhibition of his works. While we worked together on the preparations, while we were setting up the sculptures in my gallery, that dark shadow lurking inside all artists was sure to surface, or at least I would catch a glimpse of it. I’m not proud of it, but I have to admit I had a little demon on my shoulder whispering that. For the exhibition I asked Kota to create works that largely avoided the conceptual. 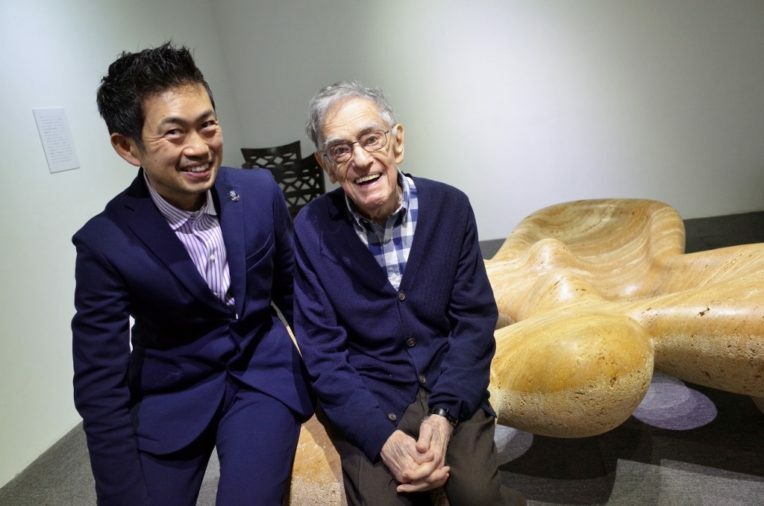 He has carried out a large number of commissions for public spaces, but here I hoped to see him engaging more directly and emotionally with the material. As of this writing I have still only seen a few of the sculptures, but I have to say these imaginative works have a purity of spirit and a compelling tension that make me ashamed of my own less-than-pure motives. As if mediating between human beings and nature, the works evoke something primal, echoing past eras when we lived much closer to nature and approached it with awe. Because of space considerations, the exhibited works are mostly of a size to which our bodies can easily relate. I encourage visitors to get close to them, feel their presences, and attune their ears to the voices of stones that Kota hears and transmits to us.